Left: Pork chops, cooked and served. The center cut or pork loin chop includes a large T shaped bone, and is structurally similar to the beef t-bone steak. 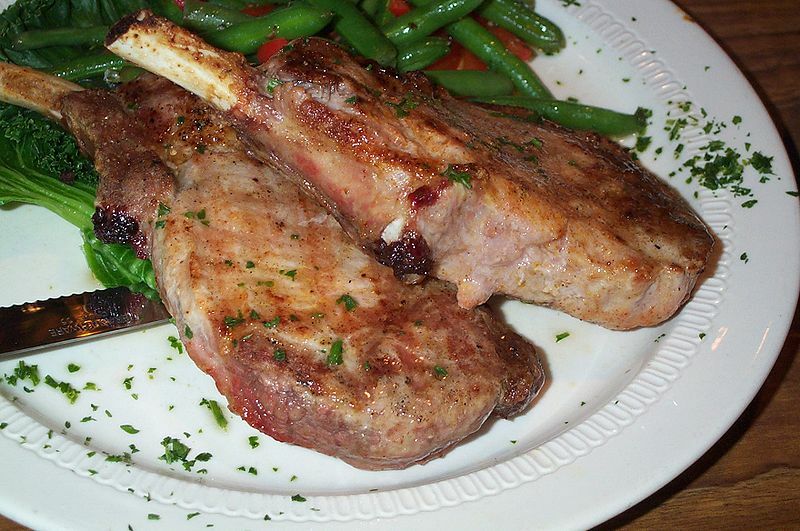 Rib chops come from the rib portion of the loin, and are similar to rib eye steaks. Blade or shoulder chops are cut from the shoulder end of the loin, and tend to contain large amounts of connective tissue. The sirloin chop is taken from the (rear) leg end and also contains a large amount of connective tissue. The so-called "Iowa Chop" is a thick center cut. The term was coined in 1976 by the Iowa Pork Producers Association. A "Bacon Chop" is cut from the shoulder end and leaves the pork belly meat attached. Pork chops are often sold marinated to add flavour; marinades such as a chilli sauce or a barbecue sauce are common. As pork is often cooked more thoroughly than beef, thus running the risk of drying out the meat, pork chops can be brined to maintain moistness.